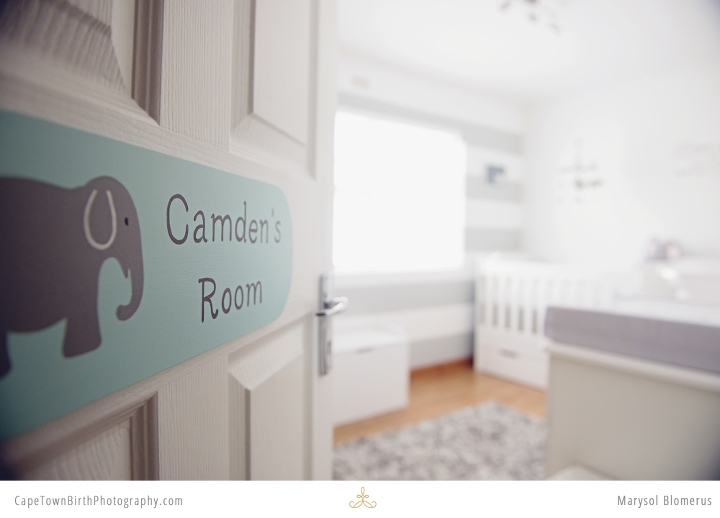 I joined Camden and his parents in his beautiful nursery when he was just 6 days brand new. If you missed his birth story, go back and see it right here. This beautiful magazine worthy nursery was all done by mom and dad, you can see the love and attention to detail they put into it. It always hits me at newborn sessions. Here is all this work, this preparation, this waiting and hoping that you put into a baby arriving. For some a total shock and then 9 months of preparing. For others, its years in the making just waiting for their turn. And then… this actual baby is in that crib. In this room. Its miraculous. Its worth photographing. And so we did. It was one of my quickest newborn sessions yet. Camden was so easy to work with and his parents were ready to go once I arrived. I really came to bond with this new family of three. Be sure to not miss the behind the scenes photo at the end of the post. Enjoy Camden and all his tiny baby toes and features. Here’s a behind the scenes shot Camden’s mom took on her phone. Thank you so much!! I really appreciate photos like these so you can see what it looks like. We just took these in home with lovely natural light and. We moved the rocker by the window to capitalize on the perfect diffused light coming from the left and an assistant reflecting it back onto dad’s right. For those of you who are curious, I’m a Nikon shooter.